At the end of the day it is all about the position of the cricket bat which will be in straight direction when a batsman plays a cricketing shot. 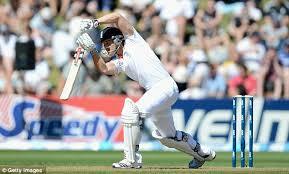 A straight bat shot can be played both on front and back foots depending on the situation. Some of the cricketing shots like drives played in mid-off, straight, mid-on regions with full face of the bat and also other shots like inside outs, lofted drives, straight pulls, back-foot punches, front foot shots (down the track), slogs etc played from mid off to mid on sector region will be considered as straight bat shots. Here we need to understand that, a straight bat shot is nothing but, a bat which will be positioned in straight vertical direction during the impact of the ball. That means at the end of the day we got to realize that straight bat shots are integral part of vertical bat shots. Every straight bat shot is a vertical bat shot but every vertical bat shot need not to be a straight bat shot. Straight bat shot = playing straight (mid-off to mid-on sector region with full face of the bat) + vertically directed positioned bat. What is a full face of the bat? A straight bat with full face is the best safer position (when compared with cross and horizontal bat shots) to play any kind of delivery like can dominate the swing or deviation of the ball on the front foot and bounce of the ball on the back foot by showing full face of the bat. Here the full face of the bat is nothing but the area of certainity of a ball hitting on the bat will be maximum and infact ranges from toe of the bat to shoulder of the bat. But when you open or close the face of the bat during playing a shot or when you play a shot with a bat positioned in cross or horizontal direction the area of certainity of a ball hitting on the bat will be minimum, resulting in minimum control over the swing or deviation or bounce of the ball when you compare it with a straight full face bat. At the end of the day you got to understand that if there is a good swing and bounce, since there is a minimum area of certainity of a ball hitting on the bat, there will be always a chance of getting top edges, outside edges or could be deceived with these bat positions. This is one of the reasons why the great cricketers always suggest the batsmen to play straight as much as possible when there is a great swing and bounce going on around you. 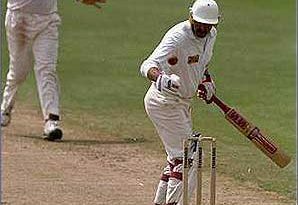 Finally even if the batsman misjudges the bounce or swing of the ball, a straight bat with full face can still really save you from getting top and outside edges for most of the times. Therefore atleast in the initial overs of the match specially in test cricket when the swing and bounce is going on around you, the batsmen needs to play straight as much as possible in this period as suggested by cricket intellectuals. When a straight bat shot is played on the back foot, because of straight vertically positioned bat with a full face, the vertical area of certainity of a ball hitting on the bat will range from toe to shoulder of the bat. It means, it will have very good ability to negotiate the bounce of the ball which actually moves vertically after hitting the pitch. 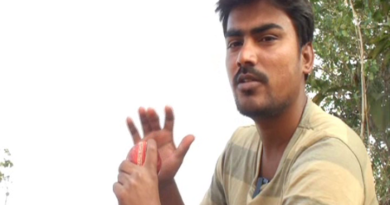 And also you get more reaction time to predict the bounce of the ball when you play on the back foot. Well half of the work will be done in dominating the deviation or movement of the ball, when the batsman actually gets to pitch of the ball using his front leg. The remaining part should be done by the batsman is just to play straight as much as possible with full face of the bat. Well with these both techniques, the probability of getting edges will be minimum compared to other batting techniques. 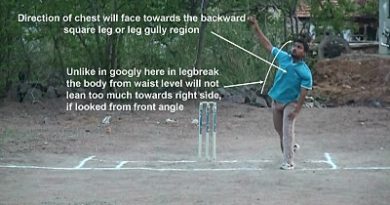 The above techniques are basically used by the batsman specially in test cricket and may be used in the initial overs of one day or T-20 cricket formats when the ball is bouncing and moving around.